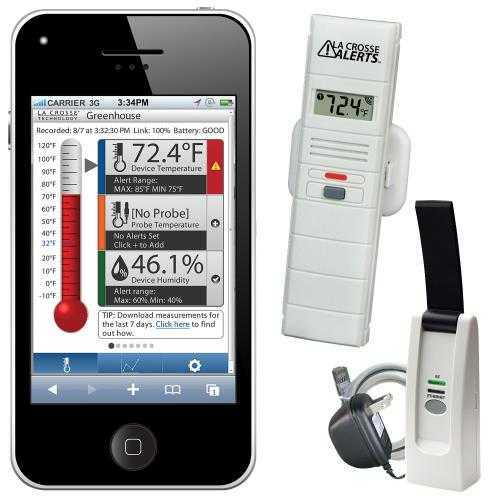 Use a smartphone, tablet or computer to remotely monitor temperature and humidity levels that affect your home, business, vacation home or rentals. Protect your property. Prevent frozen pipes, mold growth and food spoilage. This system includes a wireless sensor that measures ambient temperature and humidity and a gateway to enable remote monitoring. Monitor indoor temperature and humidity with the sensor. Receive e-mail and text alerts for temperature and humidity readings outside of your parameters, connection loss and low battery charge. A 3 month trial subscription of alerts included. The sensor LCD toggles temperature and humidity. Add up to 5 sensors (sold separately) per gateway.